What is the Marketplace for Unlocked Phones? Do you have an entrepreneurial spirit that is just waiting for the right opportunity or idea to turn your business acumen into a profitable future? Maybe you have a technical aptitude that provides you with just the edge you need to be successful in today’s age of high-tech digital communications technology. Here’s the great news – the door is wide open to creating your own profitable business through buying and reselling unlocked cell phones. With literally millions of cell phones in use and the market changing constantly, the potential customer base is phenomenal to say the least. Just read any newspaper, blog, technical publication, or retail advertisement and consumers are besieged with the latest models of cell phones with the latest technical features and applications. Consumers line up to get the new technology even though their existing devices are still quite useful. Just because a well-known manufacturer has a newer more powerful device certainly doesn’t mean the prior model is useless. Technology just drives many of us to want the latest and greatest on the market, and advertising convinces us we have to move forward with technology. So How Do I Turn This Into a Business? With so many phones readily available at bargain prices it becomes a buyer’s market. You can select from the best manufacturers and the most recent models that you may want to build an inventory for, to resell at a profit. Thousands of cell phones show up on reputable auction sites every day as consumers upgrade to a different carrier or model. But if the original owner cannot get a reasonable price for the device, where does the profit come in? Most individuals do not have the technical ability or knowledge needed to unlock a cell phone or other digital device. This often requires very specific unlock codes and detailed instructions to reliably and safely unlock your phone. These steps and cell phone unlock codes vary significantly among manufacturers, carriers, and models. Further, it can be difficult to gain access to the codes and instructions needed to unlock your specific phone. This makes research time-consuming to obtain the information needed to be successful in unlocking phones. While some information can be found through surfing the Internet for such values and instructions, much of it is unreliable or questionable at best. Now you know that there is a demand for used phones, that they are readily available at bargain prices, and that you can add value by providing unlocked phones to prospective customers. The remaining question is how you actually get your various devices unlocked so that you can build your inventory. Not many consumers actually know how to unlock a cell phone and nearly as many do not even know that this is an option. Cell phone providers do not want their customers to know that their cell phones can be unlocked either, and may even threaten customers with service cancellation, although it is perfectly legal. Sales of 21 phones in a single month at an average profit of $77 per phone. This is strictly a part-time effort netting $1,617 in one month. Another reseller flipped 11 phones in a single weekend at a profit of nearly $1,000. So the opportunity is real and potential is based on the time you have available to spend searching for phones with resale potential and relisting them at a reasonable profit. Don’t trust yourself to make the right purchase or sale price that will earn you a profit? When you find a phone you’re considering buying, check out the estimated price on Movaluate.com. Also check eBay for recent completed sales of the same item to get a good feel for realistic selling price. This will boost your confidence that you are making a profitable selection. Some technical services are best left to experienced professionals. Cell phone unlocking is one of these tasks where utilizing seasoned technicians provides reliable and successful results. This is where UnlockBase can assist you with consistent reliable phone unlocking services. UnlockBase has a proven track record of expertise in this highly technical field with over 5 million cell phones unlocked in 165 countries. UnlockBase technicians are the experts who truly know the myriad phone unlock codes that facilitate the reselling of phones to your prospective customers. They can be your critical business partner in providing unlocking support for phones from various carriers, manufacturers, and models. UnlockBase is simply the most authoritative cell phone unlocking company in the business. Partnering with UnlockBase as your affiliate will guarantee accuracy in providing phone unlock codes and successfully unlocking your phones. Unlocking services are provided on a timely basis to get your phones unlocked and ready for sale quickly and efficiently. This shortens the turn-around from purchase to re-sale making your business more profitable. Through partnering with UnlockBase, your customers will receive added value in purchasing an unlocked phone that is not restricted to any particular carrier or service. This gives them flexibility when using the phone and brings you an edge over other cell phone resellers who do not have the expertise or technical knowledge to unlock such a variety of makes and models. Search the recognized and respected auction sites for desirable used phones and add them to your inventory. Use the web sites that can help you determine market value for used cell phones. Do not limit this to the usual sites like Craigslist and eBay. Partner with UnlockBase to receive phone unlock codes and services. Resell the unlocked phones at a respectable profit. There is a considerable market for these unlocked phones that are no longer restricted to certain carriers or services. 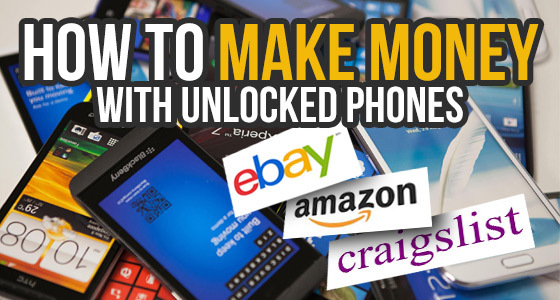 Now is the time to get started turning used cell phones into profit.